This is one of the most culturally-rich regions of Greece with 4,000 years of traceable history, but golf here is in its early infancy. Peloponnese is rated 5.0 out of 5 based on 1 verified reviews from YGT customers. They played and stayed (we even checked they signed their scorecards). 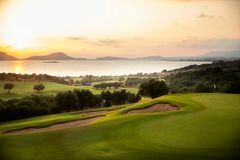 While Greece has a sprinkling of golf facilities the Peloponnese region has, at present, only one golf resort, on its western shores at Costa Navarino. On this western side of the region is Olympia, the sanctuary of Zeus and site of the ancient Olympic Games. Time seems to have stood still in much of the Peloponnese, and even in the larger towns the pace of life and the people are more traditionally Greek than in some of the more touristy islands. Traces of the rich history of the area are very evident, with Bronze Age citadels, Greek and Roman temples, fortresses and settlements of the Byzantines, Venetians, and Turks scattered over much of the countryside. The scenery is stunning, with imposing ruins, beautiful countryside and massive mountains covered with low evergreen, oak, and pine trees which surround coastal valleys and loom over craggy shores and sandy beaches.